Find the ideal keyboard solution for your work style with the Humanscale 700 Diagonal Corner Keyboard Tray, which was designed to fit on angled or corner desks to bring your board closer to your Neutral Reach Zone. This keyboard tray features a sturdy platform with angled edges in the rear, and is designed to fit the angled edges of a diagonal corner. This is great news for users of desks with less straightforward configurations, as it allows you to mount a keyboard tray in trickier corners. The tray is constructed of phenolic to create an ultra-strong, remarkably thin 1.25 inch composite that's non-toxic, durable, and easy to clean. The Humanscale 700 Diagonal Corner Keyboard Tray is ready to deliver comfort-transforming work to offices everywhere, and is now available with a Design Your Own option. The Humanscale 700 Diagonal Corner Keyboard Tray is only available in Black. Select from two different palm rest options for your Humanscale 700 Diagonal Corner Keyboard Tray: foam or gel. Both are covered with an easy to clean, black synthetic leather. A 19 inch slim gel palm rest with synthetic leather cover is also available for users with thin keyboards. The slim palm rest is only about a quarter of an inch thick and is available in black or silver. Slim palm rests are not compatible with swivel mouse platforms. When designing your Humanscale 700 Diagonal Corner Keyboard Tray, if you choose to not add a palm support, there will be holes located at the installation points on the tray. 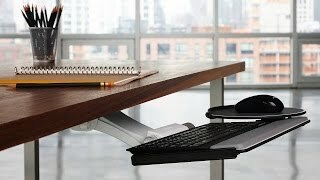 The Humanscale 700 Diagonal Corner Keyboard Tray can be ordered with a black mouse pad to fit any of the available mousing platforms. I've used the Humanscale keyboard tray at work for years. I ordered one for my home office, too. It's sturdy and adjusts for a perfect fit.